‘Tis the season to be social! The holiday season is the perfect time to ramp up your hotel’s social media marketing to capitalize on the holiday buying frenzy to drive website traffic and boost online direct bookings. Below are a few tips our team has compiled to help with your holiday social media strategy. Facebook giveaway/sweepstakes – the key to running a successful social media campaign is planning and defining a strategy ahead of time. A well planned social media contest or sweepstakes can drive significant ROI for your hotel in terms of traffic and assisted revenue. Define goals and identify the key performance indicators (KPIs). Decide on the type of contest you’ll be running. Create an official marketing plan and strategy, which should include your budget. Identify the right platform(s) for your campaign – Facebook, Twitter, Instagram, etc. – and make sure you are aware of the channels’ policies. Give a great prize appropriate for your audience/target market. The prize should connect to your customers and relate to your service/product. Promote, promote, promote! Don’t limit your promotion strategies to social media alone just because it’s a social campaign. Allocate some $ for PPC as well. Don’t forget to select your winner. Make use of the data you collect in future campaigns. List of places children can take pictures with Santa. A+ if your hotel or business is one of them! There you have it! Three social media tips you can easily implement to drive traffic and direct bookings for your hotel or business during the holiday season. 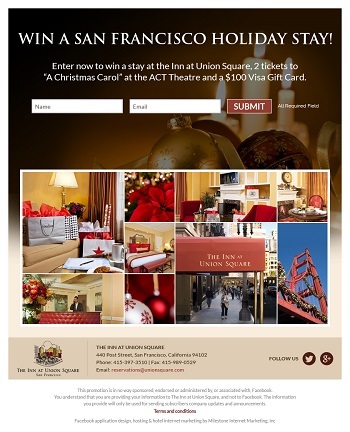 For more hotel marketing tips for the holidays, watch our recorded webinar! For more information about our hotel social media services and how Milestone can help drive ROI for your hotel, contact us by clicking here. Thank you for your article. It’s is really a good read. Home Hotel Marketing Snapshot And How to Budget for 2015 [Webinar]	Google Continues to Push Panda 4.1 Algorithm Update – How Will It Affect The Hospitality Industry?